Microsoft continues to aggressively expand its retail presence, building new stores in close proximity to Apple's existing retail locations. The first Microsoft Store opened in Scottsdale, Ariz., in October of 2009, attempting to replicate some of the great success Apple has had opening its own stores across the world. The Microsoft Stores borrow ideas from Apple, including a "Guru Bar" akin to Apple's Genius Bars where employees assist customers, and Microsoft even attempted to hire away some Apple retail employees for its own operations. Since Microsoft's retail venture began in 2009, the Redmond, Wash., company has continued to quietly expand its brick-and-mortar footprint. Microsoft's official retail website advertises that 11 new stores are "coming soon" across North America. The Village at Corte Madera, Calif.
Christiana Mall in Newark, Dela. The Florida Mall in Orlando, Fla. The Shops at Prudential Center in Boston, Mass. The Mall at Rockingham Park in Salem, N.H.
Walt Whitman Shops in Huntington Station, N.Y. The Westchester in White Plains, N.Y. The Fashion Centre at Pentagon City in Arlington, Va.
Microsoft's new store at the Westchester Mall in White Plains, N.Y., is set to open soon. In some cases, these grand openings will be accompanied by entertainment to help drum up interest and draw crowds to the events. For example, the first 1,200 people who visit the new Microsoft Store at Orlando's Florida Mall for its August 16 grand opening will receive wrist bands to see the artist Flo Rida perform two days later. 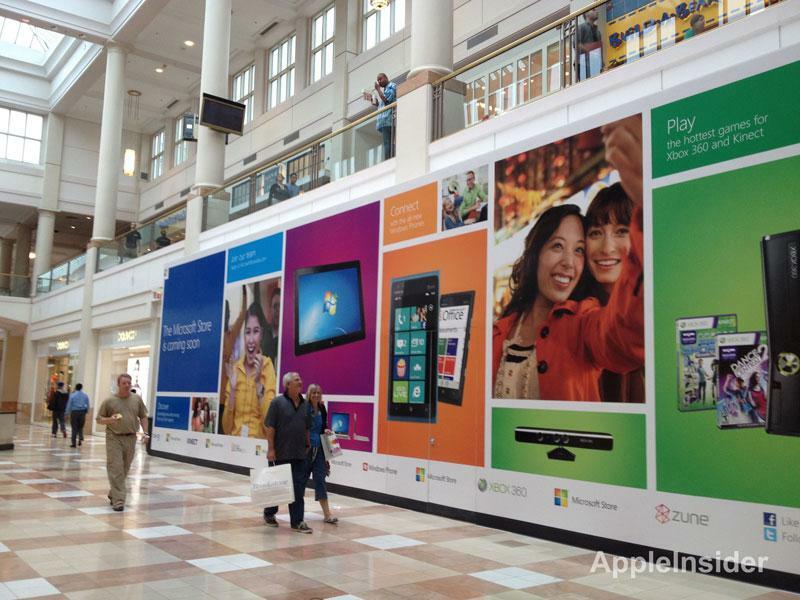 Microsoft has used this strategy across the country to hype its retail store openings. The Black Keys played a show when Microsoft opened its store in Seattle's University Village in 2011. The upcoming 11 store openings, including its first outside the U.S. in Toronto, will represent a huge increase in Microsoft's retail presence Since 2009, the Windows maker has opened a total of 20 stores to date. A Microsoft spokesperson told AppleInsider that those 20 stores have seen more than 13 million customers over the last three years. "This is an opportune time for our company to connect directly with our customers and put a face on Microsoft," the spokesperson said. "Our stores are one way to do that." Microsoft declined to share details on its retail plans going forward, but said the company is "committed to the success of our growing store network." The company's ongoing retail push comes as Apple's own retail operations are in a transition period. Last year, Apple's head of retail, Ron Johnson, left the company to become CEO of J.C. Penney, while Apple hired John Browett as its new retail chief in January. The hiring of Browett was panned by some pundits, who felt Apple made a mistake in bringing in an outsider to the company's operations. But Apple Chief Executive Tim Cook reportedly defended the hire in an e-mail, noting that the former Dixons CEO was the "best by far" that Apple interviewed for the position. Apple is also in the process of expanding many of its stores across the U.S. to accommodate considerable foot traffic. The average Apple retail store is 8,400 square feet, slightly larger than the 6,000-square-foot size Apple targeted when it began its retail operations 11 years ago. But as the number of visitors on a per-store basis has grown at an annual rate of 15.3 percent, Apple has had to rethink its strategy and move some existing stores to larger locations. Last month, Apple opened its revamped SoHo store in New York City, which was expanded with an additional 5,000-square-foot space formerly occupied by the U.S. Postal Service.